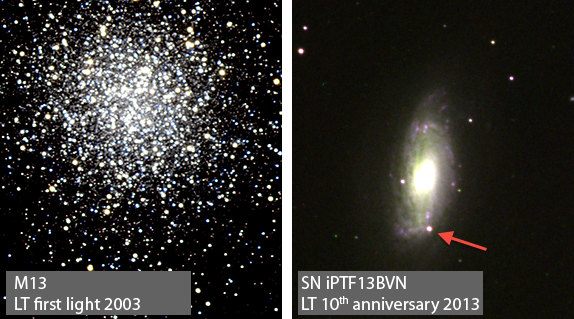 On 21st July, 2013, the Liverpool Telescope celebrated the 10th anniversary of Engineering First Light1 with a solid night of robotic operations. The skies were clear, the "seeing" (image sharpness) was fair, and the near-full moon rose majestically from the east at about 9pm, local time. Four different instruments ( IO:O, FRODOSpec, RINGO3 and RISE) were used to observe Exoplanets, T Tauri stars, Novae, Supernovae, Gamma Ray Bursts, and Blazars. In all, data for nine different research projects were obtained and some examples of these tenth anniversary observations are included below. The story was quite different ten years ago. Back then, an optical eyepiece was installed and the commissioning team needed to look through the telescope by eye to confirm the optical alignment. 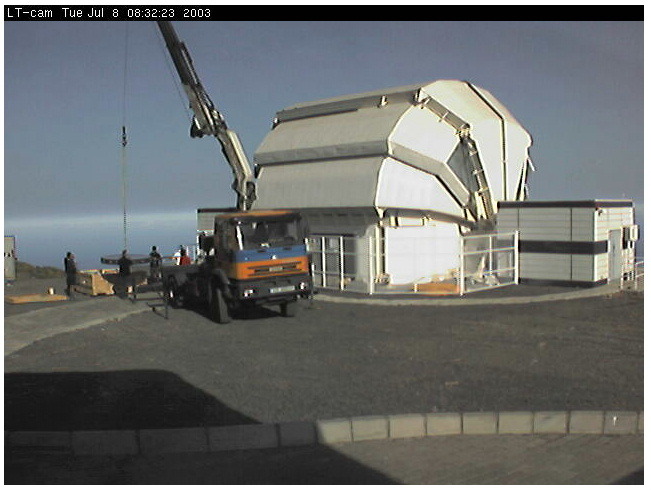 That changed very rapidly and within a week the first instrument, RATCam, was installed on the telescope and Science First Light was achieved, on 26th July 2003 - ten years ago today. RATCam is still mounted on the telescope and continues to be used by a number of researchers (although it was not used on these 10th anniversary nights, in part because it is in the process of being decommissioned and will soon be removed from the telescope to make way for a next generation infra-red camera, IO:I). 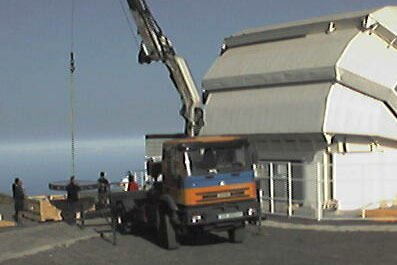 Team members spent much of late-2003/early-2004 on La Palma commissioning systems until routine, fully-automated and unsupervised operations of the telescope, enclosure and instruments commenced in late 2004. 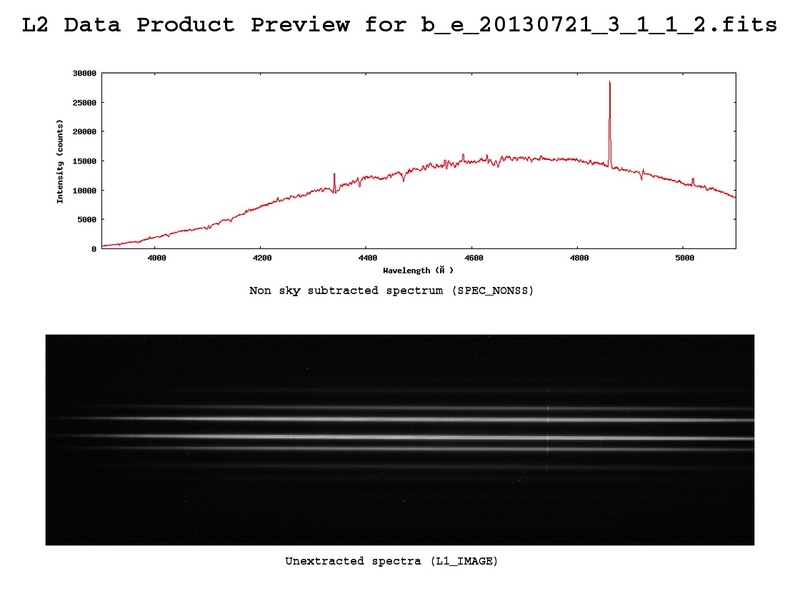 Very few observatories ever publish their true first light image, that is, the very first time photons ever passed through the telescope to be recorded by a camera; but, for bit of fun, here is ours! 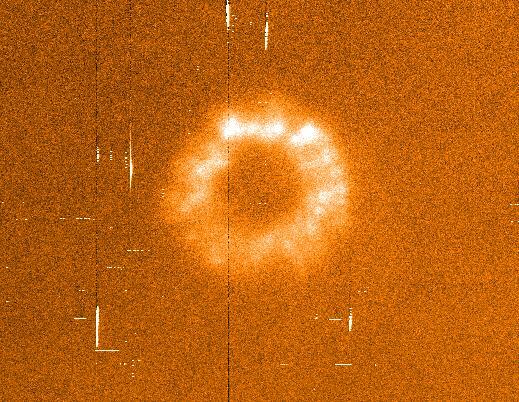 This image, taken on 26th July 2003 before the optics were properly aligned and before the telescope had even been focussed, is of course not representative of real science data from the LT. A defocussed, single bright star exhibits the characteristic 'doughnut' shape of unfocussed images in a Ritchey-Cretien type telescope. Only a couple of hours after taking this image we obtained the correctly focused image of M13 displayed near the top of this news article. Ten years ago, as now, the telescope served a diverse user community. Though the majority of the time is used by UK-based professional astronomers, several observers work in research institutes across Europe and around the World and 5% of the telescope time has always been made available to school children through the National Schools Observatory programme. Since 2003, almost 60,000 observations have been secured for students from schools throughout the UK. A broad range of science projects have been conducted on the LT over the past decade and highights from many of them may be found in the LT News Archive. A few of the projects started in 2003 are still running even now, delivering unprecedented long-term monitoring of interesting astrophysical systems. It seems appropriate that the 10th anniversary of First Light coincides almost to the day with the launch of a new project, Liverpool Telescope 2. A complement to the LT, LT2 will make full use of the changing face of astrophysics, as time domain studies move progressively to the forefront of modern astronomy, driven by the launch of the GAIA satellite later this year, and the completion of ambitious ground-based observatories like the Low Frequency Radio Array (LOFAR), the Square Kilometer Array (SKA), and the Large Synoptic Survey Telescope (LSST) over the next decade. In the meantime, the LT continues to work at the cutting edge of robotic astronomy, reacting to triggers from telescopes around the world and in space and monitoring transients, outbursts, and variables, in many cases immediately after they are discovered. 1First Light marks the point when the first images are obtained through the newly-constructed telescope.